Is iron ore above sustainable levels? Along with a number of commodities, iron ore rallied sharply in 2016. This was in stark contrast to the prior three years when continually rising supply met flat demand growth. Last year, however, saw an exit of high cost producers, the shutdown of Samarco, and declines in Chinese production. The year also saw a credit surge as Beijing saw growth deteriorating faster than anticipated, with the US Federal Reserve in particular citing China as a key reason for pausing its rate hike program. At Merlon we invest in undervalued companies (measured on the basis of our assessment of sustainable free cash-flow) where misperceptions in the market are adversely impacting share prices. When assessing the sustainable free cash-flow of iron ore miners, we need a long-term view on what a sustainable iron ore price is. Our fundamental research, discussed in detail below, analyses demand, supply and cost to estimate a normalised price. In the short run, as we saw in 2016, prices can deviate from fundamentals, through the effects of transitory events such as policy, supply disruption and speculation. Over the long term, the investment horizon we use at Merlon, price will be based on the cost of supplying a tonne of iron ore to a marginal buyer. We review each of these long term factors below. Chinese steel production, as we know, has risen strongly (Figure 1), and now accounts for more than half of the world’s production. Supply side reform: One downside risk to Chinese steel production comes from government policy aimed at reducing excess steel-making capacity. Although 2016 saw the permanent closure of 45mt of capacity, much of this was idle, with no impact on production. 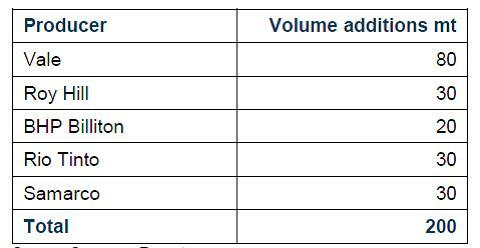 There is an additional 50-100mt of further cuts directed by Beijing, which is more likely to affect active capacity. Addressing active capacity will more directly support steel pricing and the financial viability of loss making enterprises, and will have a direct effect on iron ore demand. Pollution control: The government is also under growing pressure to address the level of pollution evident across China. Much of this pollution comes from steel mills and coal-fired power generation. While growth of less emissions intensive power generation continues, authorities have to date relied on a ‘name and shame’ strategy for heavy emitters. We expect this stance to harden as the environmental effects of heavy industry impacts an increasingly middle-class population. Credit: Chinese steel demand in 2016 has been supported by aggressive credit expansion. This has served to stabilise what had been three years of declining demand. As the effects of these policies diminish, so too will the demand for steel, an effect potentially exacerbated by any negative debt effects of both consumers and producers of steel. Debt is approaching 3 times the size of the Chinese economy, with debt servicing costs consuming 15-20% of GDP. External pressure: We also know that more recently a growing amount of this production has been exported (Figure 1). This is because China’s demand for steel has peaked, consistent with prior examples of rapid industrialisation and economic development seen in Europe, the US and Japan. With rising pushback from export destinations and an increasingly insular political impulse globally, exports are likely to decline from here. Chinese domestic demand, having enjoyed the effects of stimulus in 2016, will likely see this impulse retreat as noted above. Global iron ore exports have grown three-fold, from 500mt in 2000 to 1,500mt in 2015. This supply growth is set to continue, with Merlon forecasting total supply of 1,800mt by 2019, driven by a number of low cost miners completing projects as set out in Figure 2, below. With flat to declining demand as discussed above, we expect a growing surplus. Furthermore, continued RMB depreciation, as capital seeks better investment opportunities outside China, an effect now magnified by rising US interest rates, will see Chinese domestic iron ore production more competitive in USD terms, and pose a 50-100mt addition of supply which had previously exited on low cost supply growth. An additional risk is substitution, in the form of steel recycling through the form of melting scrap steel generated through an ageing car fleet and property demolition and reconstruction. Our iron ore demand forecast assumes no change to current 165mt of scrap used in China. However, at some stage this number will rise as the economy continues to mature, and the environmental appeal of recycling grows, an effect seen elsewhere, such as the US where recycling now accounts for two-thirds of steel production. Commodity currency depreciation – key currencies such as the Australian dollar and Brazilian real are all experiencing downward pressure and will continue to do so as Chinese growth moderates and domestic financial conditions deteriorate. Chinese currency depreciation – despite importing 1bt of iron ore in 2016, China is also a major iron ore producer. As the Chinese currency (RMB) depreciates, an increasing volume of domestic capacity becomes competitive relative to imports, a factor driving steadily higher production rates throughout the year. Increased use of technology– technology is a continuous process, driven by competition. As tonnages have increased significantly, so has the investment in technology, as seen in driverless haul trucks, driverless trains, automated ore wagon maintenance, and centralised control centres. Declining labour unit costs – in addition to using less labour per tonne of ore produced, driven by technological gains, the cost per unit of labour is expected to decline. This is to be driven by declining demand for labour, as automation advances and as higher cost producers exit the market. Recent research by Merlon has found that this effect is already occurring, particularly on the east coast of Australia. Leveraging greater scale– the major producers have all increased production volumes 3-5 fold but are still harnessing the additional scale as incremental tonnes are added (Figure 2) and efficiency gains are realised. Consumables deflation– a recent trip by Merlon to China saw major miners increasingly confident in using Chinese made plant and equipment, as quality rises and cost competitiveness remains. The effect of reduced costs is seen in Figure 3. The combination of lower Chinese steel exports, continued low cost supply growth, and underlying cost deflation is represented graphically in Figure 3. The point at which forecast demand of iron ore intersects the forecast supply curve is USD32/t (or USD30/t in real or ‘inflation adjusted’ terms). So where does our USD30/t price forecast fit in the context of history? Our forecast of USD30/t clearly appears low relative to current pricing at around USD80/t. Compared to the long term average of USD50/t (a commonly used assumption), our forecast also appears low. However, spot prices as we have mentioned, have been driven by transitory factors such as policy, supply disruption and speculation. End product substitution – Consumers of a commodity end product such as steel find ways of using less of it. Steel buyers can use altered steel products, created by including alloys such as boron and molybdenum, which enable less steel to be used while retaining strength and structural rigidity, or aluminium as seen in the auto sector, directly impacting demand for raw material inputs (iron ore). Raw material input substitution – Consumers of inputs to manufacturing and end product find ways of using less. In the case of steel manufacturing, the development of electric arc furnaces enabled the recycling of scrap steel. This development has seen more than two-thirds of steel production in the United States achieved using recycled steel, whereas China has yet to significantly develop its steel recycling sector. Cost reduction – as a commodity product, iron ore producers seek to compete on the basis of cost, hence continuing to drive cost reduction through the measures noted above. Demand maturation – although the demand for steel can be dominated by economic development on a temporary basis, as seen in the cases of China, Japan, post war Europe and the US (Figure 5), economies mature, where the need to keep building steel intensive new factories, infrastructure and accommodation declines. 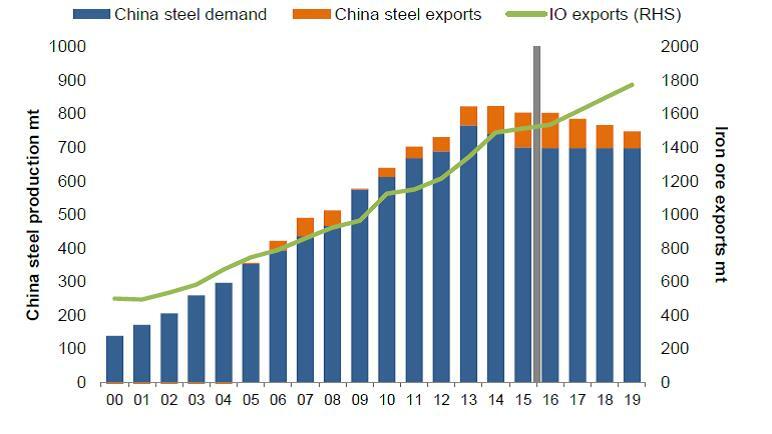 China’s domestic steel consumption appears to have peaked, with the surplus 100mt of steel being exported, creating growing trade tensions globally. We believe these fundamentally based factors will ultimately dominate long term pricing, and in turn we will see pricing outcomes more in line with Merlon’s US$30/t long term forecast rather than current pricing. Should the iron ore price remain elevated for an extended period, either through additional Chinese credit stimulus (noting debt to GDP levels approaching 300%) or a global economic recovery, miners will be incentivised to invest in new capacity, significantly impacting their free cash-flow. Our conviction score reflects market misperceptions as indicated by what share prices are factoring in relative to a range of sustainable iron ore prices, which we see as US$20/t – US$50/t. We will have higher conviction when share prices are factoring in the lower end and conversely, as is the case now, lower conviction when share prices are factoring in iron process above the upper end of this range. The combination of long-term overvaluation and low conviction means we have no investments in iron ore miners at the present time. You compare China with US steel consumption. Not a good comparison; Korea, Japan and Taiwan much better as the US does not use nearly as much steel in its housing - virtually all Chinese housing is apartment buildings which are steel framed, while US is dominated by wood framed housing.